You could never accuse the neighbours on the eastern border of our garden of being particularly considerate: several years ago they cut down a tree in our shared hedge that was the traditional nesting site for 'our' Turtle Doves (which have never returned since.) Their side of the boundary was marked by a twenty foot high Leylandii hedge which was rarely trimmed and which prevented me seeing comets, planets and so on at the prime time just before sunrise. Three days ago (with absolutely no discussion or warning) a team arrived and started to remove the whole hedge: it remains to be seen what the impact of this will be on our garden birds and what future developments might occur. One tiny glimmer of comfort: Linda and I spent all day Friday buying and installing blinds for the windows on our east side (we hadn't needed any before!) 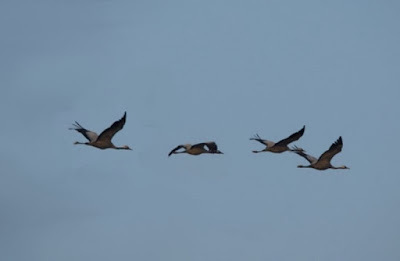 As I raised the ones on my office window this morning the first thing I saw was a group of four Common Cranes flying south east towards Strumpshaw! Super blue Moon and all that hype! Classic Rock Show at the Theatre Royal. The shepherds got it right today! It's only birdwatching, but who to believe? Nouns: my take on the current discussion. Redpolls and an Iceland Gull at Cromer! Rare event in the dawn skies! Goosed! And a terrific Moon. All tooled up for the Spring!